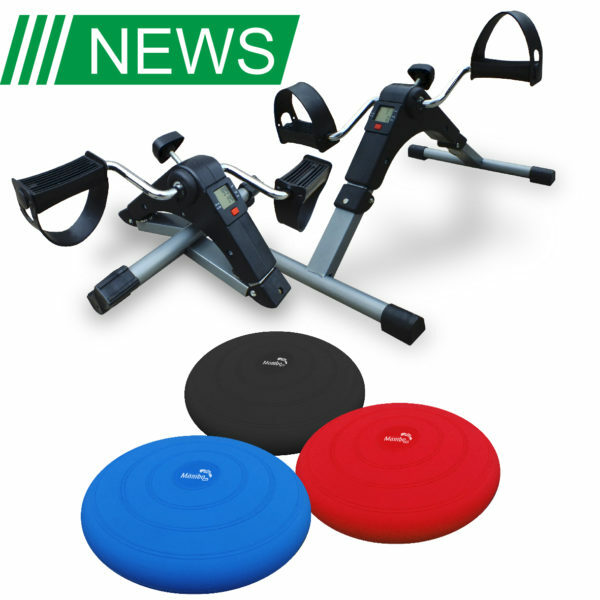 MoVeS Pedal Exercisers are ideal for restoring impaired muscle strength, improving blood circulation and giving a better coordination to the legs or arms. It can be used on a table top as an arm exerciser or on the floor to give the legs a workout. A convenient resistance control knob allows a broad range of pedal resistance for a progressive exercise programme. Mambo Max Sitting Cushions are air-filled cushions for active and dynamic sitting, recommended by therapists. These easy-to-carry air cushions activate intrinsic trunk muscles to support the spine and are suitable for everybody. The surface from these sitting cushions can easily be cleaned with soap and water. The Comfort Gym Mat is a new addition to our line-up and comes in 3 popular colours: black, blue and magenta. The Mambo Max Gym Mats provide a soft touch and comfortable exercise environment. They are perfect for gym & fitness. Non-slip, well-cushioned surface with a unique closed cell structure. The mats are equipped with plastic rings 40cm apart so they can be suspended while not in use. Each mat comes with a handy storage/carry strap. With the Mambo Max Wooden Work-Out Station an even higher amount of exercises is suddenly available. The cleverly spread rings allow you to attach a resistive exercise band or tubing for various vertical and diagonal exercises. The Work-Out Station is designed to fit an Aerobic Step or a set of Oval Balance Pads. This mix of various products results in a complete and challenging workout. Combining balance with resistive exercise triggers many different muscles in your body. The Mambo Max Wooden Work-Out Station truly offers a complete and three- dimensional workout.